George Herbert Walker Bush is dead . . . or is he? If you have read any of the reflections the past few days, as I have, you will discover the magnitude of his love for wife Barbara, and you will read how she regretted that in dying, she was leaving behind her beloved George, but that she was comforted that she would see him again. And you will read how he declined a recent opportunity to go back to the hospital, but elected to stay home, and pass on, because he missed Barbara, to whom he had been married 73 years. And in dying, he was anticipating seeing her again “on the other side,” as well as their three year old second-born, who died of leukemia many years ago. To all of this, without doubt, many will say “hogwash” or “B.S.” or something worse. Many will ridicule all of this, and write it off as a fairy tale. Which brings me to Lillian. Lillian was a sassy Jewish woman whom I met when I lived in the San Francisco Bay Area. She was smart and outspoken, and was quick to usher fools to the nearest exit by the shortest route possible. She earned a living making photographic directories for churches and synagogues. She’d been doing it for about thirty years. In that capacity she met Yeshua-believers of every stripe, many of whom took the opportunity to share their faith with her. She thought it was all B.S. And she was quick to say so. That all began to change, and dramatically, at a retreat we had for Shavuot one year (which we called an Ingathering). A bright man named Larry Brandt, who now lives in Israel, designed the liturgy which was majestic, and we even had banners of some sort and a bit of a processional. And something happened that breached all of Lillian’s defenses: she sensed the presence of God. It was real. It was undeniable. She could not explain it away. The experience haunted her with a holy haunting. Not long afterward, she took ill. For about a year her doctor treated her like a silly old woman (pardon me for that, but this was how that doctor saw her) and he pooh-poohed her reports that something was not right. Finally she got an X-ray. The technician said, “Lady: that’s the biggest tumor I ever saw.” And it was on her liver. Lillian didn’t have long to live, and we had a conversation. She was listening now. I went on. So getting back to George H. W. Bush and Barbara Pierce Bush, his beloved, and their daughter, Robin, with whom both George and Barbara expected to be reunited. Were they fools? Well, let me leave you with this. It is a common conceit to imagine that the disciples were primitive hayseeds who would believe anything. Not so. Two thousand years ago is not that long as things go, and Matthew the tax collector, and the professional fishermen who met for forty days with the risen Yeshua were not inclined to believe that dead people come back from the grave. Technologically, they didn’t have iPhones or iPads, and couldn’t use one if they tried. But neither can we navigate and earn a living fishing on the stormy Sea of Galilee. These were not gullible guys, but very grounded in reality. And that was it, Thomas believed big time. And then there’s Saul of Tarsus, a.k.a. the Apostle Paul, one of the most towering intellects of Western Civilization. People are still writing books about him and his writings two thousand years later. I think my friend Rabbi Dr. David S. Rudolph, the world’s premier Messianic Jewish Pauline scholar, has 500 books in his library about Paul and his writings, and counting. Paul was an adamant opponent of all of this. He joined Lillian in thinking it was all B.S. . . . and worse! It was heresy and he would have nothing to do with it except to stamp it all out. Then he encountered the Risen One on the road to Damascus, and he was utterly transformed, spending the rest of his life traveling throughout the Mediterranean world, amidst much deprivation, shipwrecks, beatings of various kinds, and an extraordinarily demanding schedule, telling all who would listen “It’s all true! He IS risen and all of us will have to face him as the Judge of all some day (which Daniel the Prophet had long before promised would be the case). All of the Apostles and Paul would themselves die brutal deaths, Paul himself being beheaded, Peter crucified, etc. All of these shrewd and cynical Jews died separately for their belief that Yeshua had risen, is now the Judge of all, and worthy of their complete service…to the death. These men, above all others who ever lived, were in a position to know it was all a fraud. And none of them would have died such deaths if just admitting it was a fraud would have gotten them set free. But they all gave up their lives, because they believed what Lillian finally came to believe: that those who live and believe in him will never really die. They believed their friend Yeshua had truly conquered death, because they had encountered him as the Risen One, and his Spirit had utterly transformed and miraculously empowered their lives. 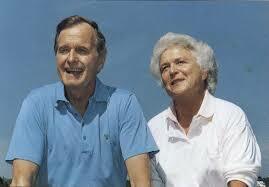 So, getting back to Bush 41 and Barbara. Fools or faithful? And how about you? What do you say? Is your bet on, “When you’re dead you’re dead?” Or have you placed your chips on the Man from Galilee? There is B.S. here. But it just may not be the resurrection: it may be believing it never happened. The B.S. may just be thinking that George and Barbara were nothing but fools for believing all this. Fantastic post, Rabbi Dauermann. Thank you! Thank you Judah. Sorry to be late in getting to you. I am revising my scheduling policies so you can expect a more rapid response henceforth. I agree with your quotation from Paul/Sha’ul but would also remind us all that George H.W. Bush was also a man of faith, although from a class and a generation that did not wear it on one’s rhetorical sleeve in the manner that some have come to expect. Again, thank for ringing in.